Country music is at its most potent level when its songs are about real life. And the current single from newcomers Branch & Dean is about as real and heartbreaking as you can possibly get. Titled "The Dash," the single is making an emotional impact with listeners all over the country. The song was written about Theron Branch, the son of member Steve Branch, who lost a long battle with Cystic Fibrosis in March. "When you have the response like we have on this song, it just lets me know that we have done the right thing," Branch told Billboard. "My son gets to live on through this song and our career." Marlon Dean Scallan says that the lyrics of the song strike a chord with a lot of listeners. "We're guaranteed one breath, then after that, we're all on a time clock. You don't know how long you might have. That's what this song is about. Of course, with Steve's son and his story, it's about taking a tragedy, and maybe somewhat of a silver lining where we can do some good and touch some people's lives." Steve says that the song picks up Theron's legacy. "My son always liked to help people, any way he could. He had Cystic Fibrosis when he was born, and when he was about ten, they asked if he wanted to be a part of some studies on some new medicines. It could help a lot of people, but it could also hurt him. I had a talk with him, and asked him about it. He was going to get paid a certain amount of money, and I told him 'If you want to do it, that's your money, but don't do it for that -- do it because you want to help somebody. He thought about it for a week, and decided he wanted to do that. The studies did help a lot of people," his father reflected. Branch & Dean are trying to continue that work, as well. "One of our dreams was to be a spokesperson for them, and we just finalized the paperwork to be National Cystic Fibrosis spokespersons," beamed Scallan. "Part of the single and album proceeds go to them." 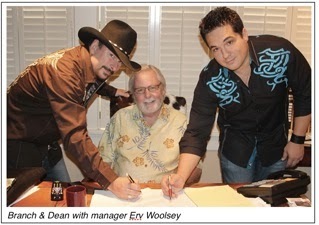 The duo have just signed a management deal with Erv Woolsey – who has been the mastermind behind George Strait's legendary career, as well as that of Lee Ann Womack. They are glad to be in such company. "He's had a little bit of success, and he's such a great guy too. It was so surreal when he sealed the deal with a handshake. He said 'This is how me and George did it.' We were in shock. If we have a tenth of his career, how awesome is that," said Scallan. The two grew up around the same area in Florida, and were very aware of each others' talents. "I always thought if you wanted to be a country singer, you had to sound like Steve Branch. He could do that, and I couldn't. I dove into songwriting. I always looked up to him as a singer, for sure." Branch recalls that Scallan's mother was one of his early champions. "His mother was one of my teachers, and she was so big in doing things for the community, and still does today. She was judging at a talent contest that I was in. I sang 'Rose Colored Glasses,' the old John Conlee song. I didn't win, but was ok as I thought I had did my best.' I was getting ready to leave, and she stopped me and said 'Were you really singing that song?' I said 'Yes, M'am.' She couldn't believe it, so she told me that she was going to have me singing around the area a lot, and that's what happened. The two have just released their self-titled debut album, which Scallan says he is very proud of. 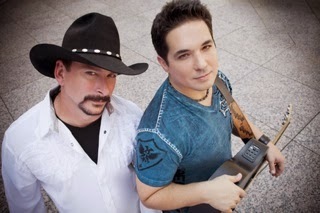 "One thing we fell into here in Nashville is song people like Michael Huffman, who is such a connoisseur of great songs. So, the bar was really high. We tried to pick great songs, and hopefully time will tell if we were right, but we've had really good response thus far. In my years here, I think a great song is the only thing politics can't touch. Everything else can be very unsure. There's so many pieces that have to work together. But, a great song is the one constant." Let the video below send the message to your heart how important "the dash" truly is. Take a minute to say hello to the guys on Twitter at @branchanddean. They're the best people. We had the pleasure of spending time with Steve and Dean during CMA Fest at Nixa Country's World's Largest Fan Club Party and once I met them, I knew this was a duo that we would give everything we can to help support. We hope you do the same.